Single screen access. 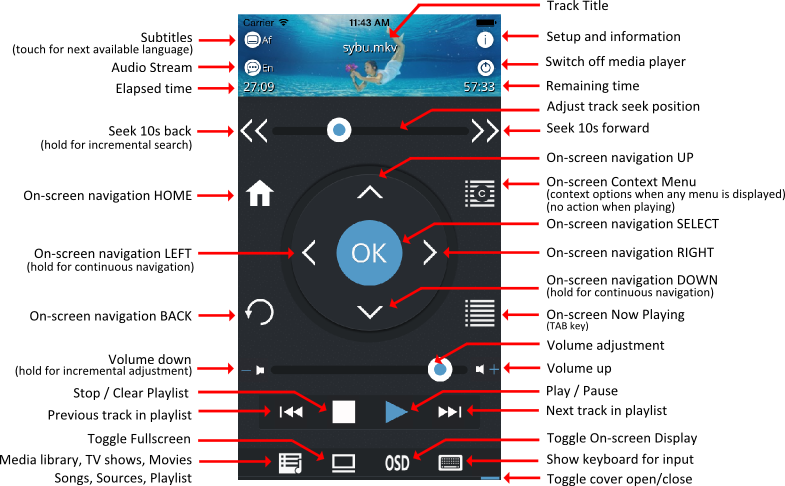 Quickly navigate and control Kodi. It just works – Simple and easy to use. Best Kodi remote on the app store. Works great – This app works perfectly with my kodi box and openelec. Great App – This app found my raspi right away and also has easy navigation. Works perfectly! – The wife understands it and uses it. What more good can be said? Awesome remote app – This app is incredibly easy to use and set up. I love it. Plus you can’t beat free. I run Kodi on my Raspberry Pi 3 and this app works like a charm. Simple, clean design. Easy to use. Very nice interface, good job. It simplifies a lot especially when I need to type its quick and easy. Absolutely brilliant. Much quicker and easier than using the Kodi remote. Instructions for set up clear and easy to follow. Makes navigation and searching very convenient. Quick access to favourites as well. Simple à prendre en main et fonctionne contrairement à d’autres app. Also mehrere Apps probiert aber die hier ist mir am liebsten. Funktioniert einwandfrei und die Bedienung ist auch Super!! Genau das, was man braucht – App bietet alle Funktionen, die man braucht, in übersichtlicher Form. Top! Posted in Projects, iPhone iPad Apps.